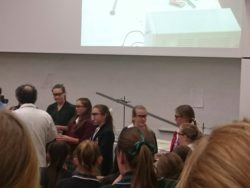 On Thursday 27th October, 9 students competed in the inaugural Digital Science Awards at UNE. This program follows on from the success of the GRASS Science Investigation Awards of previous years. The girls had to present science investigations or an explanation of a scientific concept in a digital format. Their work was then judged by industry professionals and scientists. 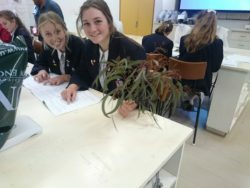 Upon arrival, the girls participated in Far Out Science activities. 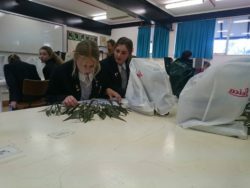 In their first activity, the girls were required to identify a particular Eucalyptus species using a dichotomous key and match it to plant material found at a faux crime scene. 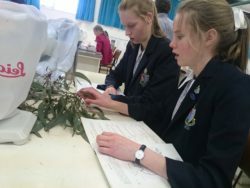 They then participated in a tour of the herbarium where they saw samples collected by Joseph Banks on the Endeavour expedition. The second activity was the Chemistry show, where hydrogen made a big bang, jelly dinosaurs danced for their lives and a lot of things were lit on fire! After lunch, the girls attended feedback sessions with their judges. 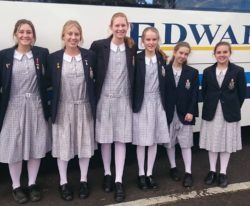 Evaluation and feedback is an invaluable component of the scientific process and it was a great opportunity for the girls to ask questions about their work and learn ways they could improve. The awards ceremony followed the feedback session. Our students did an outstanding job, picking up 3 of the awards and a cash prize each. Congratulations to all of our competitors who did a fantastic job in both completing and presenting their projects.